Societies that foster strong civil rights and freedoms have been shown to enjoy increased levels of satisfaction among their citizens. Furthermore, a country benefits from higher levels of national income when its citizens’ personal liberties are protected and when it is welcoming of the social diversity that stimulates innovation. 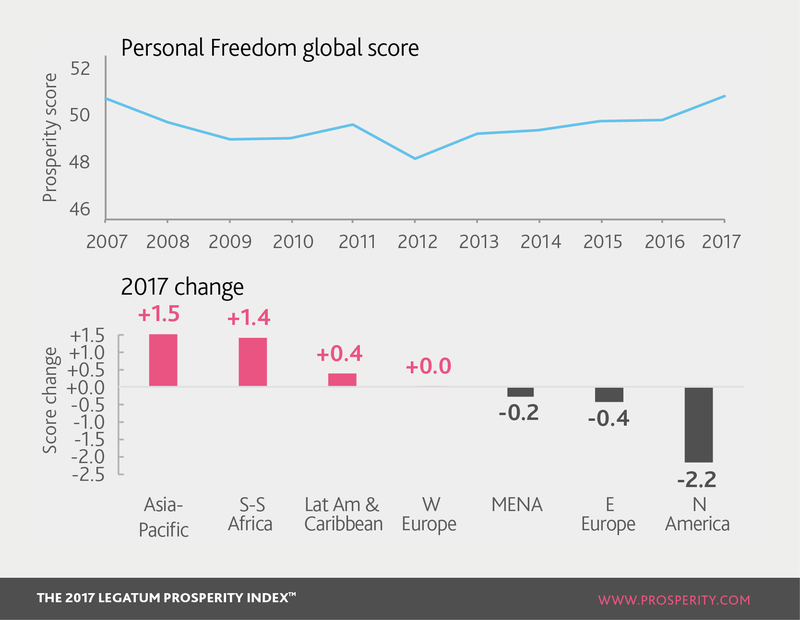 Personal Freedom has recovered from a worldwide low in 2012, bettering its 2007 level for the first time. Asia and Sub-Saharan Africa registered the strongest growth this year, with Latin America and the Caribbean also making improvements. In 2016-17, Personal Freedom in North America fell by more than in any other region. Basic Legal Rights measure the degree of personal autonomy. These mean a lack of interference and coercion from the state, and the right of association. They include the right to one’s own person and freedom around what information they can publish and consume. Only Latin America and the Caribbean marginally improved its score in 2017 in this sub-pillar. MENA was the fastest faller – through decreasing freedom of expression and also a sharp decline in press freedom in the last five years. Cyprus was the fastest riser in the whole of Europe, as it reduced the length of compulsory military service by half. Poland meanwhile saw the largest drop, in light of decreased civil liberties. Its press freedom also fell more than any other nation in 2017. Individual Liberties means citizens have the opportunity and capability to choose how to live their own life. This includes belief and religion, alongside the right to own property regardless of gender. Iraq has seen the greatest increase in its citizens’ satisfaction with their freedom in the world over the last five years. In the last ten years, Togo and Nepal have seen the greatest rise in satisfaction with freedom. Social Tolerance measures how well society respects and benefits from a diversity of peoples’ religious beliefs, ethnicities, origins and sexualities. Cultural and religious diversity have positive economic impacts, with new ideas, new markets and a general culture of creativity and innovation emerging from the interaction of people from different backgrounds. Despite its plummeting overall prosperity, citizens of Venezuela reported a greater level of tolerance toward ethnic minorities, LGBT individuals and immigrants in 2017. The greatest share of North America’s large fall in Personal Freedom came through decreasing Social Tolerance, in particular reduced social tolerance of freedom of religion.